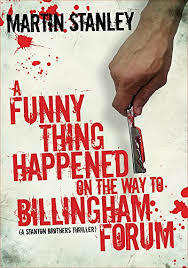 It has been a long wait, but Martin Stanley’s new Stanton Brothers novel, A FunnyThing Happened on the Way to Billingham Forum, is finally here and it just may be the best book in the series (and that says a lot). As always, the brothers are up to their necks in crime and violence, and also at each other’s throats. When the brothers get some intel from a snitch and agree to hijack a drug deal, they anticipate a smooth plan. Troubles arise when they need to bring a new crew member on board and they are unsure of his ability to keep to the plan. Sure enough, he takes too much liberty during the commission of the crime and he leaves them exposed and on the radar of some dangerous men. Instead of taking their money and running away, Eric Stanton insists they do the honorable thing and help their contact out of the rough spot he now finds himself in. Trouble and violence soon follow suit and the Stantons must extricate themselves from this round of trouble, as well as try to stop some former cronies from getting their desired revenge on the brothers. Stanley has a knack for doing everything right in his books. His writing is both fun and engaging, with a nice layer of suspense thrown in for good measure. The banter between the brothers gives his books a nice touch of comic relief, but not so much as to distract from the action. This book rises above the many crime novels I have read due to the level of character depth Stanley infuses into each character. The characters come to life through the backstories Stanley weaves into his narrative and the reader truly gets the sense each character is 3-dimentional and alive; allowing us to understand them, their motivations, and allowing us to understand their actions. I really have enjoyed seeing Eric Stanton grow throughout the series. He is a deep character and, although he commits amoral actions, he has a moral center to which he stays true. He is a good man who resides in a bad world. He makes decisions that only hurt people he feels have it coming to them and he does his best to keep innocent people out of harm’s way. Having his brother as his sidekick allows him to have muscle as well as an opposing viewpoint for every decision he is faced with. The two characters play off each other very nicely and add a great amount of humor and tension to the book. Overall this is one of the better books I have read this year. From great recurring characters, fresh new characters that have great depth and show great depravity, a good plot, and some excellent writing, this book should attract a large audience of readers who are looking for a fresh take on a familiar plot tale of a robbery gone awry.